Since you are reading this welding titanium section, I suppose you’ve been on this site for a while and you are already familiarized with the touch of magic that titanium has. I’m sure there is no need to further elaborate on the titanium properties. But titanium cannot be used for anything as is, or by itself. The atoms of the titanium don’t rearrange themselves so as to best fit what the designers and the engineers have envisioned. And the uniqueness of the metal, which makes it the proffered choice for many things, may also be its main disadvantage. Titanium is, among other things, a proud metal. It does not yield easily. But I truly think there is no stop for the ingeniousness of the human mind. Things have always been done this way, and will ever be. In order to become part of the Boeing we’re flying it, or the space shuttle we watch on television breaching another boundary of expansion, titanium metal has to be machined, refined, bent to shape and weld. Welding titanium has always been looked as next to impossible task. Titanium is a reactive metal that forms compounds with less than optimum properties the unalloyed metal displays and which are looked for when conceiving an engineering solution. The surface heated in air generates brittle carbides, nitrides, and oxides, each of which can reduce the fatigue resistance and top notch toughness making the part next to useless for what is expected. Chlorine from the perspiration on the operator hands can create localized corrosion. No, I’m not kidding. Titanium legendary corrosion resistance is put to test if machining is not addressed properly, so welding titanium should really be perceived as it is. That is, a tremendous and laborious task which should not be taken lightly and where each minuscule detail can make the difference between success and failure. This is a general valuable truth for any metal that is weld, and is usually done more or less at the beginning of every welding operation. Welding titanium does not leave room for errors. Always clean the metal with the utmost care. A chemical pickle or at least stainless steel wire brush is also a must. A great importance is the solvents that are to be used. Remember what I said about perspiration? Chlorinated fluoric-carbon (CFC) solvents are forbidden for use with titanium and titanium alloys. Acetone or methyl ethyl ketone (MEK) are allowed and are a perfect solution. There are many welding solutions available today. For titanium, the most used one is gas tungsten arc welding (GTAW), also known as tungsten inert gas (TIG) welding. Other welding possibilities were successfully applied, tailored to the specific requirements of the application involved. Oxyacetylene welding is not applicable to welding titanium or titanium alloys. What really separates titanium welding from most other types of GTAW is the need for an argon cover on the weld’s back side. Wherever the titanium is heated, a brittle alpha-case can form. For very complex parts with interior passages or parts that require a lot of welding repairs, glove boxes may offer an economical answer. For parts too large to fit through the glove box, special flexible polyethylene plastic bags, complete with attached gloves, can be used. Working in airtight gloves, especially for extended periods, can be hot, but doing so is part of the challenge of working with titanium. 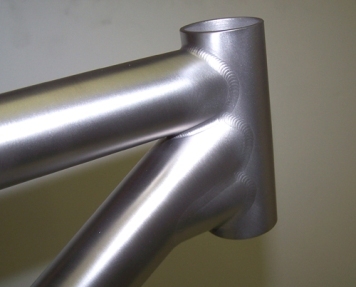 Well-done titanium welds look like frozen mercury: shiny and reflective. Just like the picture. In order to reach this stage you must undertake exactly the first two steps as they were outlined above, and have sufficient patience to let the protective gas flow running until the metal has cooled below about 500 degrees Fahrenheit.